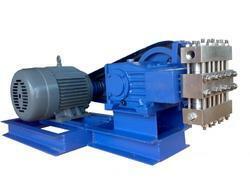 We are a leading Manufacturer of high pressure pumps from Ahmedabad, India. We are leading manufacturer, Importers and Service Provider of High-Pressure Pumps and our product is made up of good quality. High Pressure Pumps are available from pressure 25kg/cm2 to 550kg/cm2. HP from 03Hp to 150HP. For Tube Cleaning of Heat Exchangers, Boilers, Evaporators and Condensers. For Motorized Hydro Test application.